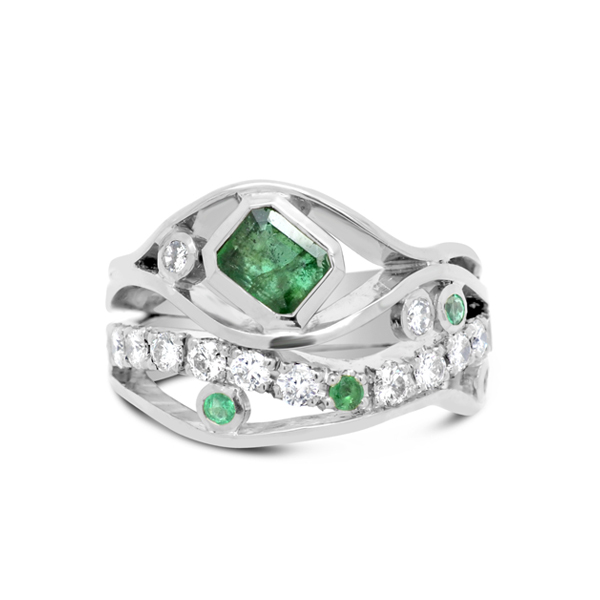 A four strand platinum wave ring set with an emerald cut emerald and round brilliant cut diamonds and emeralds pave set. The strands work to combine gemstones and diamonds together that might not otherwise sit happily alongside each other in a more formal ring. The effect of these combinations, as you can see, gives a highly individual contemporary look. Small round brilliant cut diamonds and emeralds have been pave set into the bands which undulate dictated by the shapes of the larger stones which sit in rub-over settings. This design is perfect for reusing your own diamonds or gemstones or choose from the wide range of gemstones that we keep in stock, special stones can be sourced for you..